Fundraiser by Rezan Onen-Lapointe : Rezonance Showcase Adventure! Rezonance has been honoured with an invitation to perform in the Early Music America “Emerging Artists Showcase” at the Early Music Festival in Bloomington, Indiana, this May. This is an exclusive and prestigious performance opportunity that will draw international attention to the ensemble. Participation in this event will also be a fantastic learning and ensemble development opportunity. We will be performing our much-loved program of Handel arias, "Handel's Heroines," featuring coloratura soprano Vania Chan. As you can imagine, the costs associated with this trip are significant. While we have applied for several travel grants, they cannot be relied upon for funding -- we are counting on the generosity of private donors to help get us to Indiana. Anything you can contribute to help us reach our funding goal is greatly appreciated! 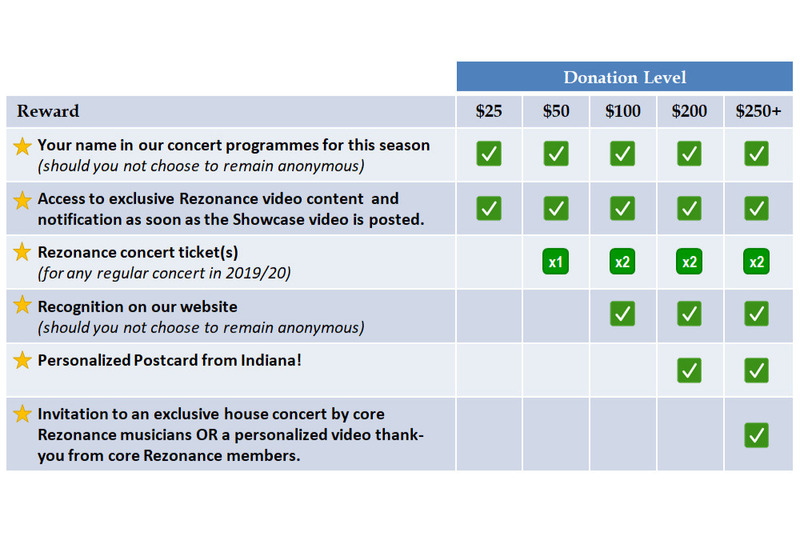 For concert tickets, the postcard and house concert we will contact you for some information required to claim your reward. Rewards must be claimed by July 31, 2019. Note: In the event we exceed the total amount of funds required for this trip, all excess funds will go towards our upcoming concert season. Rezonance Baroque Ensemble has been bringing Toronto and the surrounding region fun and artistically excellent concerts since 2012. We are a non-profit organization, incorporated in Ontario. We are a chamber music group (2-6 players) and are committed to revitalizing and re-imagining music from the Baroque era. Rezonance’s founding members are violinist Rezan Onen-Lapointe and harpsichordist David Podgorski. We are joined by other musicians who have a specialty in historical performance to work with us on each performance. We also provide education initiatives to the public and young music students. Our main concert season includes 3 main concerts and several collaborations with other groups. All our regular season concerts take place at St Barnabas on the Danforth Church (361 Danforth Ave). Thank you for supporting local emerging artists! !